Degrees are conferred three times each year following the end of each term in August, January, and May. Commencement Ceremonies take place once a year in May. All students who have completed degree requirements during the previous year (June through May) may participate in the May Commencement Ceremonies. Please refer to your Undergraduate or Graduate Catalog for graduation requirements specific to your major/program. Any student wishing to graduate should contact their Dean’s/Program Director’s Office to discuss the completion of their requirements. All students must apply to graduate in order to receive their degree. La Salle University has one Commencement ceremony each year in May. 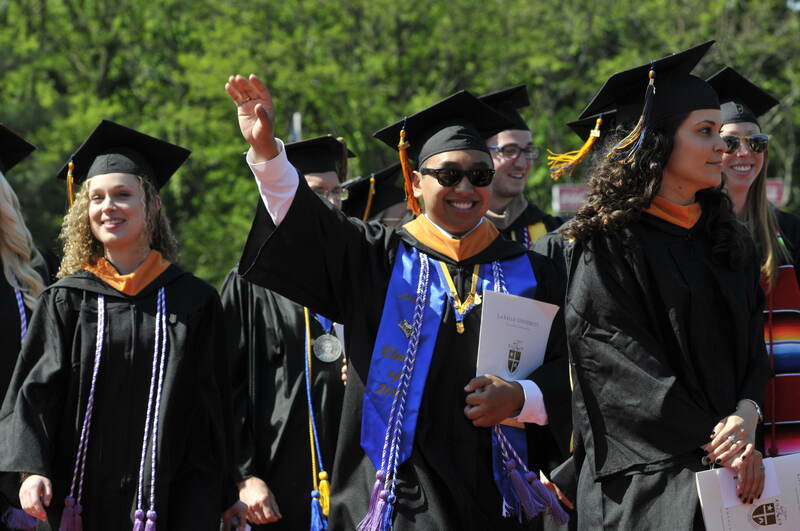 All students who have completed degree requirements during the previous year (June through May) can participate in the May Commencement ceremonies. All students who graduate in the previous August, or January, or who plan to graduate in May will receive a Graduate Guide in March. This Guide contains information on all Baccalaureate and Commencement Ceremony activities. If you have questions regarding Baccalaureate or Commencement Ceremony questions you may visit La Salle’s Commencement web site or send an e-mail to commencement@lasalle.edu, or call 215-951-1900.